Large + Small Motor Skills Activity: Giant Dot-to-Dot! 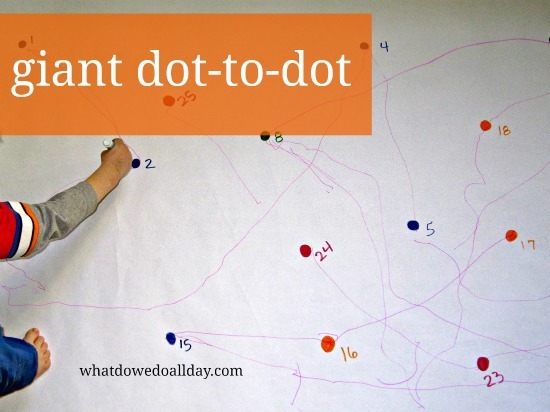 A fun fine and gross motor skills activity is a giant dot-to-dot. You may remember New Kid working on his toddler dot-to-dot a few years back, and now he likes to get down with his marker on the floor. I love the way a giant floor connect-the-dots activity gets him exercising both his small and large motor muscles together. You don’t need to arrange the dots to reveal a picture when connected. I simply drew large dots and numbers in a random pattern on a large piece of butcher paper. For this particular puzzle, I used several colors, so it was easier for him to locate sequential numbers: 1-5 were blue, 6-10 were green and so forth. He enjoyed this activity so much he wanted to do it again, but I didn’t even need to make a new one, he simply chose a different colored pen. See how he needs to stretch, reach and move! New Kid’s occupational therapist informed me that working large groups of muscles is important for developing the small motor skills, that I should not limit our therapy exercises to just fine motor skill practice. Plus, I love that the giant dot-to-dot sneaks in a bit of counting practice, too! Math + fine motor + gross motor = a Giant Dot-to-dot! Follow Erica • What Do We Do All Day?’s board Indoor Activities for Kids on Pinterest. I love that idea- Carly would too, I know! What do you use for paper? I bought a large roll of butcher paper at Discount School Supplies. It’s lasted me several years. You can get through amazon, too, I think. Brilliant idea! Definitely trying this with my kids! Such a clever yet simple idea! So awesome!!! I love this! Math and gross motor and pure fun!!! You are a genius! What a fabulous idea! I absolutely must try this. A great combination of fine and gross motor. I love that it’s a big scale. Makes dot-to-dot different. Thanks for sharing. Even my older son like to do it! What a fun idea! Pinning this to try with my son. Maybe he can connect the dots with trains! What a cute and easy idea! Kids really like things that are oversized; my kids enjoy drawing things on giant pieces of paper. Yes, he likes the change from just sitting at the table.